The Centers for Disease Control and Prevention responded Saturday to a sick passenger on an international flight that landed in Newark, New Jersey. A picture from inside the cabin of United Airlines Flight 998 from Brussels Oct.4, 2014. Late Saturday, University Hospital in Newark said that the man's symptoms were found to be consistent with a treatable condition unrelated to the deadly Ebola virus and that he would be released with continued monitoring. Erica Dumas, a spokeswoman with the Port Authority of New York and New Jersey, confirmed to CBS News that the man caught the CDC's attention by vomiting onboard United Airlines Flight 998 from Brussels. United spokeswoman Jennifer Dohm said in a statement that upon arrival at Newark Liberty International Airport medical professionals instructed that passengers and crew remain onboard until the sick passenger could be assisted. Dumas told CBS News that by 1:50 p.m. everyone was off of the plane. Passenger Raymond Schraff told CBS News that a male passenger and a young girl were taken from the plane. The man was wearing a surgical mask, and the girl was not. CDC workers wore full body protection when they escorted the man from the rear of the plane, Schraff said. The girl, who the hospital later said was found to be asymptomatic, went with a flight attendant. Officers with the U.S. Customs and Border Protection agency collected the man's luggage, Schraff said. An announcement was made to passengers that the man wasn't contagious, Schraff said. According to United, the flight landed at 12:15 p.m. with 255 passengers and 14 crew members onboard. 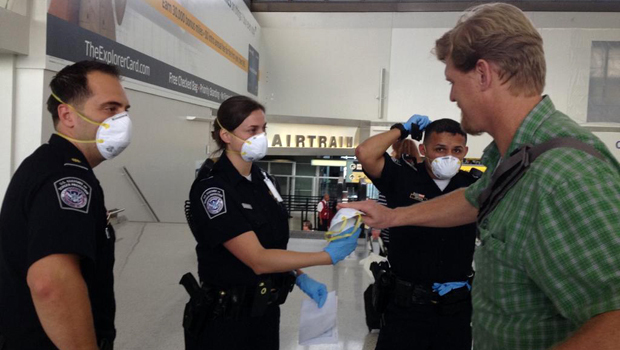 The CDC's response comes within days of the agency announcing the first case of Ebola diagnosed in the U.S.
That patient, Thomas Eric Duncan, flew to the United States on United after a layover in Brussels.